To conclude this series of baked treats for the Kid's Delight event, here are some healthy and kid friendly carrot muffins. My little one never gets bored trying out new versions of muffins and if I let her decorate those cupcakes/muffins, all the more happy. 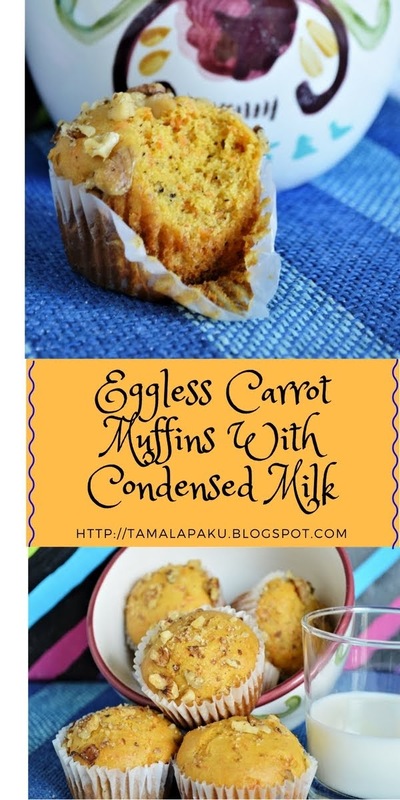 These muffins tempted my older one too. Preheat the oven to 350 °F. Line the muffin pan. Whisk the condensed milk in a mixing bowl until light and fluffy. [I used an electric beater for 2-3 minutes]. In another bowl, sieve together the flours, baking powder and baking soda. Mix in the carrots and chopped walnuts. Set aside. Add oil to the condensed milk and whisk until incorporated. Slowly add the flour mixture while beating the condensed milk. Continue beating until well combined. Divide the batter into the muffin pan and bake for 22 minutes or until the toothpick comes out clean. I checked once at 17 minutes and then at 22 minutes. Serve warm with milk for a filling snack. After the brownies which I posted yesterday, here are some savory scones for the non-sweet lovers. I love scones when I can make them with wheat flour and less fat and healthy ingredients. Better still if they are savory. I made these a few months back and I cannot recollect the recipe source. In a mixing bowl, sift the whole wheat flour and baking powder. Add in salt and green chili paste. Rub in the olive oil. Dump in the grated zucchini and chopped coriander leaves. Mix well. Gradually add yogurt to the flour and gently mix to get a sticky dough. Don't knead at all. Just gather the sticky dough and oil your fingers to pat the dough into a circular shape (about 1/2 inch thick). I patted the fried onions on the scones. Best way to do it is to line a baking sheet with parchment paper and transfer the dough onto it. Pat it with oiled fingers and slice into 8 wedges. Bake it for 20-22 minutes until a tester comes out clean. Remove onto a wire rack. Slice and serve warm with a dollop of butter. To end this series of festival dishes, here is another fruit based sweet which is easy and quick in the mango season. The basic version is to just prepare the semiya kheer and allow it to cool before adding the mango pulp. But the sugar needs to be adjusted depending on the sweetness of the mangoes. Coarsely crush Cashews and Almonds and add it to the boiling milk. Mix well and add the sugar. Let it boil for about 4-5 min while mixing it, so that the milk doesn't burn. Garnish with Roasted Cashew , Almond and Raisins (Optional). Allow the Kheer to cool. Mix in the mango pulp and refrigerate before serving. Here is another sweet dish perfect for offering to the Lord. If pineapple is readily available this is a breeze. Since we all like semiya, this was received well at home. Boil 3 cups of water and add the roasted semiya and boil until cooked through. In a heated non stick pan, add sugar and crushed pineapple with juice. Let it simmer until the syrup is sticky (about 5-6 minutes). Add in the crushed almonds and the cooked semiya. Mix well so the semiya is coated with the syrup and pineapple. Let it simmer for a couple more minutes and remove from heat. This week I shall showcase some ideas for dessert/sweets for Varalakshmi Puja which is celebrated in many South Indian families. In fact these sweets are perfect for any festive occasion. I came to know of this recipe from a friend who told me that this is a very traditional sweet which is made in their families. She told me the deep fried version but I chose to go the low fat route. But this recipe can easily be used to deep fry and enjoy this sinful sweet. Soak the moong dal for a couple of hours. Drain and grind it into a smooth paste adding as little water as needed. Make small portions of the paste and arrange in a steamer and steam for 15 minutes. Remove from the steamer and mash it adding the sugar, crushed almonds and cardamom powder. Make teaspoon portions of the filling and set aside. Make sure the dosa batter is not too runny. Heat the appe/paniyaram pan. Drizzle oil as needed into the appe slots. Scoop a portion of the filling, dip in the dosa batter and gently slide into the appe slots. Cover and allow them to cook. After the undersides are golden brown, flip them carefully and let them cook for a minute or so. To conclude this series of comfort thalis, here is a simple thali made for my older one. My older one turned 16 a few months back and it being a weekday, we had a simple dinner at home with a few of her favorites. Featured here are Palak Paneer Burji, Roti, Rice, Drumstick Rasam, Mango Pickle, Yogurt, Eggless Zebra Cake and Sesame Brittle. In a heated pan add oil and cumin seeds. After they crackle, saute ginger-garlic-green chili paste for a few seconds and then saute onions until golden brown. Add in the tomatoes, turmeric, red chili powder, salt, dhania-jeera powder, Amchur powder and along with a cup of water. Let it boil and the mixture come together. Cover and let it cook for a few minutes. Add in the blanched palak and shredded paneer. Mix well and let the flavors blend for a few minutes. Sprinkle garam masala and kasuri methi, cover and remove from heat after a couple minutes. In this series of homey and comforting meals presented in the form a thali, here is yet another meal with all my personal favorites (barring the Vankaya/Eggplant which I am allergic to). Featured in the platter/thali are Dosakaya Pappu, Mamidikaya Menthi Baddhalu, Vankaya Kothimeera Kaaram, Apple Pachadi, Badam Kheer, Rice and Yogurt. This eggplant curry is the first one I learnt from my mother-in-law after convincing her that I was indeed allergic to eggplant. I wonder why this has never been posted in my blog in the past 8 odd years. My husband and kids love this version of the curry and I occasionally make it wearing gloves and the accompanying drama :). In a heavy bottomed vessel, heat some oil and add the seasoning. Add the sliced eggplant and sprinkle a few drops of water and cook them (for about 6-7 minutes depending on the type of eggplant used) under a closed lid. Meanwhile make a paste of of all the ingredients listed under 'To Grind' and add it to the cooked eggplant mixture. Cover and allow the eggplant absorb the cilantro flavor for about 3-4 minutes. The curry is ready to serve either with roti or rice. This week I have chosen to highlight some mini meal ideas presented in a typical thali-style. The above thali is our comfort food at its best. There is Palak Dal, Chayote Squash in Milk (recipe to be posted soon), Mamidikaya Menthi Baddhalu, Rice and Yogurt. Mamidikaya = Raw mango, Menthi = fenugreek powder, Baddhalu = pieces. So this is an instant pickle made with raw mango and spices which include fenugreek powder. My sister, Jaya, has been trying to convince me that this version of raw mango pickle is a must have. But somehow, my taste buds were used to the typical taste of Mamidikaya Mukkala Pachadi and refused another to take over. But after her 'lecture' on keeping an open mind and her success with this instant pickle, I decided to give it one chance. I am ever so glad I gave in to my sister's words. We are converts now. I hope Jaya doesn't say 'I told you so' :). Wash and dry the raw mango. Finely chop the mango and transfer into a ceramic (or any non-reactive metal). Sprinkle salt and turmeric to the finely chopped mango. Scrape out the soft pulp closer to the pith and set aside. In a heated pan, add oil and prepare the seasoning. After the urad dal is golden brown and the mustard seeds have crackled, remove from heat and allow the seasoning to cool down a little. In a blender, add the soft mango pulp set aside earlier and also the cooled down seasoning. Blend the ingredients to a smooth mixture. Transfer the mixture to the bowl with the finely chopped mango. Mix well and set aside for at least an hour for the flavors to blend in. Serve with rice and ghee as part of a meal.